I had my first downhill skiing lesson between Christmas and New Year’s — ending the old year with a new sport. Now, you might not think that’s a big deal. Most of the people I know enjoy skiing. Of course they do; they live in the Roaring Fork Valley, home to some of the best ski areas in the world. But I have lived here full-time since 1978 and have never skied. Cross-country, yes, until I crashed into a tree on a turn and sprained my ankle and twisted my knee. I sold my skis after that and bought snowshoes. More control with snowshoes, less chance of injury. Anyway, I am 63 years old and my first attempt at downhill skiing was in Ohio. Yes, Ohio, where I was born and raised, at a little hill called Mansfield. It is now world-renowned, says USA Today, as the “ski capitol of Ohio” (sic). I was 16 and my boyfriend — one of those guys who could try anything once and immediately look like a pro — decided to take Amy skiing. After I fell off the rope tow and all the skiers behind me jammed up and the boyfriend had to roll me off to the side, I made a mental note that skiing was maybe not for me. I came to Colorado four years later. I have been telling myself ever since that there was no way I was going to try actual ski lifts and sliding down mountainsides after falling off a rope tow in Ohio. That has been a personal value for 43 years. But, something shifted just before Christmas, 2018. I was at Sunlight Mountain Resort, working on a radio story, and as I was gathering shooshing sounds of skis on top of packed powder on a cold, bright afternoon, I noticed how exhilarated I felt just being outside in the High Country and watching people ski on a sunny day. I asked Troy Hawks, Sunlight’s marketing director, if a 63-year old woman could take lessons. And, there I was. Got the skis from a young man called “Play-Doh.” He turns 17 in early January and started skiing at Sunlight when he was two. He didn’t seem to think twice about a woman in her sixties learning to ski. “It’ll be great! You’ll love it!” he said with a twinkle in his eye and a cute dimple in his cheek when he smiled. He told me about the skis, shorter since I was new at the sport, and how there shouldn’t be any snow between the boot and the binding. He handed me the skis and I was off to get boots and then hobble out to the snow and wait for the instructor. Then, the instructor showed up. David, aka “the Captain”. Nice guy. My age. Immediately put me at ease. We began with side steps and putting on the skis. I had his arm in a vice grip as we walked down the hill to the Corral, where the beginners learn to slide around on the snow at a safe distance from the lifts and the real skiers. This is where the metaphors begin. At 63, I have experience as a dancer, a horseback rider, and a sailor. All of this comes in handy when learning to ski. The dancer knows how to isolate body parts, like hips, shoulders and knees, to get into the correct position for walking up and down the hill, perpendicular to the gravity line. The horseback riding metaphor didn’t quite work, but there was something about turning on skis that reminded me of getting a horse to change direction. Then, it was on to “the pizza” or the snowplow as I remembered it, and some history of Sunlight. “What mountain are you skiing on?” asked the Captain. “Er, um, Sunlight?” I guessed. Nope. The slopes are actually on Compass Mountain. Sunlight Peak was behind us, to the north. The Captain is also an actor. He portrays Walter Devereaux for the Hotel Colorado and the Glenwood Springs Historical Society. Ask him about the beaver coat. Anyway, before I learned to turn or stop properly — in my mind at least — it was time to go up the mountain. I think I physically resisted this part and my face showed genuine panic. What if I miss the lift chair? What if I fall out? Luckily, I had 10 seconds to position myself and get ready to sit, and the Captain —no doubt feeling sorry for this nutty woman — held my hand the whole time. It did, however, take us at least an hour to get down the beginner hill, bringing my two-hour lesson to four. My thighs were screaming (“I can hear them,” said the Captain.) So were my knees, shins, calves and ankles. My arms were wearing out. I sat down often. But, here’s the kick. The final metaphor. During the moment when I actually let myself ski and feel the mountain under my feet, it felt just like sailing a boat. You set the course but you don’t head straight for it. Your skills help you feel the wind and the sea. I relaxed, just a little. I let go, just a little, and understood that the skills I was learning would allow me to work with the elements, in this case the snow and the mountain. It was not about getting from Point A to Point B; it was about heading in a direction and enjoying the ride. It was profound out there on the slopes. And, it was a confidence-booster. 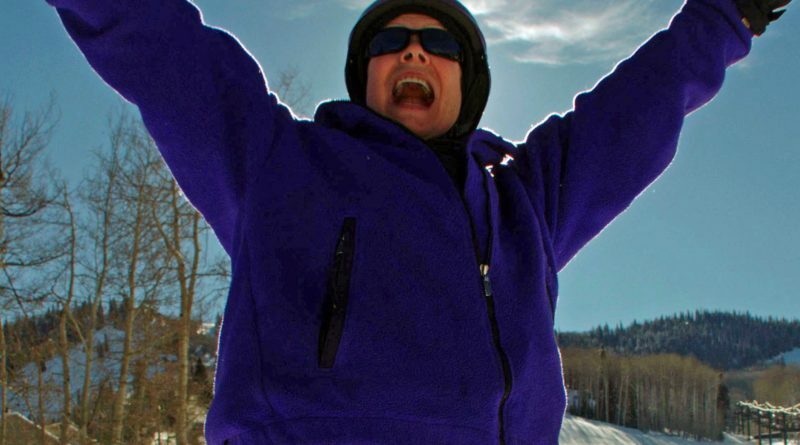 If I can learn to ski at 63 when all of my adult life I’ve been telling myself “I can’t”, just think of what else I can do, what else I can say, what else I can tell myself – if I just let go and do it. I see more skiing in my future, more loosening up of the urge to control. At 63, maybe I’m finally catching on to what life is all about. Amy Hadden Marsh is a freelance reporter/producer/photographer/skier living in the Cattle Creek Watershed of the Roaring Fork Valley in western Colorado.